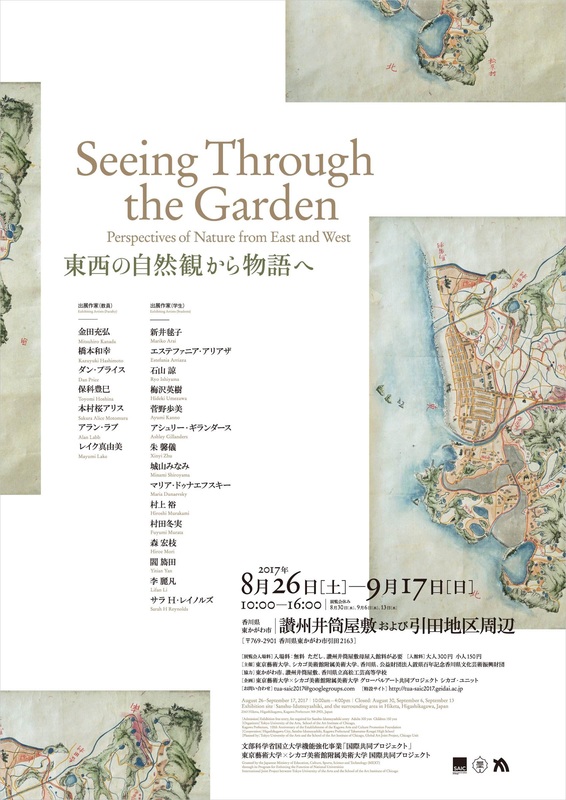 Twenty-two contemporary artists from Japan and the United States of various cultural backgrounds have developed works based on the theme of “Seeking Nature,” using Hiketa, East Kagawa City, Kagawa Prefecture as staging grounds. They consider the ways that nature is viewed with respect to their different cultural backgrounds.The works are based on their research on the natural features and histories of Hiketa and Chicago. This has deepened their reflections on the lands’ natural environment and how human beings and nature interact. The artists have conducted research on areas that exhibit this human-nature communication, such as gardens, ports, and heritage districts. This exhibition showcases contemporary artworks that express the innovative relationship of humans and nature through their own physical experiences of such multiple elements in the environment as water, plants, mountains, landscape, architecture, homes, and heavens. The Global Art Joint Project of the Graduate School of Fine Arts, Tokyo University of the Arts was established in 2015, in collaboration with the world’s top art institutions: the École Nationale Supérieure des Beaux-Arts de Paris; Central Saint Martins, University of the Arts London; and the School of Art Institute of Chicago. The Global Art Joint courses are comprised of three units including instructors, assistants, and students from the field of fine arts who together work on art projects based in various countries across the world. The Global Art Joint curriculum offers courses jointly with students from the above-mentioned institutions with an emphasis on social arts practice (the practice of contemporary art in society). In the joint classes instructors and students travel between Japan, Chicago, where they collaborate with their counterparts from top overseas institutions to carry out artistic research drawn from a variety of perspectives. As part of a socially-engaged art program, they will participate collaboratively in fieldwork, workshops, and site-specific art production. The resulting artworks are exhibited at international exhibitions.